If you are looking for the perfect gift for sports fans, especially if they get cold feet in the winter, these ugly Christmas sweater slippers for sports fans are a great choice. These slippers are super cozy and comfortable to wear to keep little toes snug and warm. They will slip on easily when in zombie mode first thing in the morning, and slide off with ease when you are ready for bed. In fact, they are so cute, cuddly and fun, you might be tempted to buy one pair for each person on your Christmas list. You can choose between professional sports teams and college teams. There are ugly Christmas sweater slippers for practically every professional sports team. If you don’t see them on this page, click through to the the two vendors that carry them and double check. Both Fanatics and FansEdge carry these items along with many other styles of slippers for people without a sense of humor. Or you might need a pair of slippers for kids. Most of the teams for pro sports are here, but there are definitely some college teams missing. Stock goes in and out of these shops, so click through when you are ready to order and see if the team you want is in. These gifts are great for family gatherings watching your football team or basketball team during the winter, but they are also great for spring and summer. They are open in the back giving enough air circulation if your feet need to cool off in the warmer weather. They make great stocking stuffers and are easily put in an oversized envelope or box to ship to your family out of state. If you are a football fan, you should find your pro team here. Look for sales on each site to get the best deal, and don’t wait too long, because these slippers are hot items. These make great gifts for people who don’t want to wear a whole ugly Christmas sweater or sweatshirt but like the fun of it. You can find scarfs, winter hats, and other accessories to match these slippers. Or do the whole outfit with leggings, sweater and slippers. Basketball is so much fun to watch in the winter, when you are stuck inside freezing off your tootsies. With these tacky sweater slippers, you will never have to worry about cold toes. Find your team on this page and click through for deals on the two sites that carry these slippers. Get all of your friends matching slippers for the teams they root for. For true blue baseball fans, you will find your MLB team in this section. If one is missing, click through and search on Fanatics and FansEdge. Stock is depleted quickly during the holidays, so place your order immediately to get your slippers early enough to slide under the Christmas tree. These make great stocking stuffers and slippers to wear on Christmas morning. For you hockey fans out there, don’t despair if your team is not on this page. There are more teams available that didn’t have images when this page was made, so just go directly through any link on this page to search for your team. Compare the two sites and order from whichever one has the best deal at the time. You will be able to have warm feet at home in front of the fire when you watch your hockey team make a goal. There are so many colleges and universities that it is impossible to list them all on this page. However, you can get a feel for what the slippers will look like, and find your college on the linked sites, Fanatics and FansEdge. They will have every college on their sites that have slippers available in this style. If they do not have tacky sweater slippers, you may find other styles that are less tacky but will still keep your feet warm. 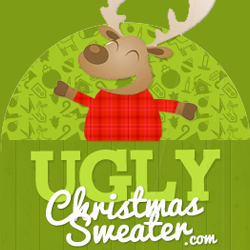 The ugly Christmas sweater theme is so much fun and colorful for anyone who wants to have a good laugh. Enjoy these slippers all winter long for an affordable price. Watch your teams on TV in comfortable, cuddly slippers. Great for New Year’s football games at home. I see my favorite team! I have to have a pair of those slippers! Sports fans are going to love these slippers. They would be great gifts!